Wynn Resorts – which won the casino bake-off with Mohegan Sun last month – looks to be quickly embedding itself in the local economy. 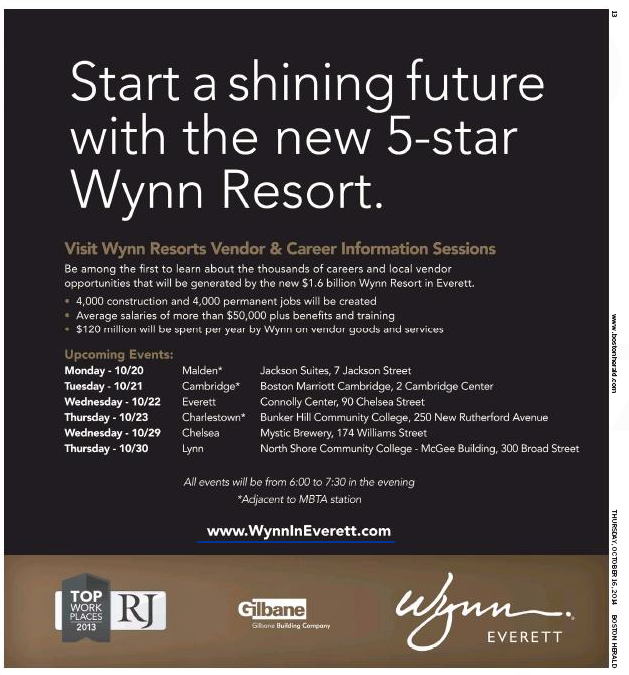 The proposed Everett gambling hell – sorry, hall (tip o’ the pixel to Raymond Chandler) – ran this ad in today’s Boston Herald to promote the upcoming Wynn Resorts Vendor & Career Information Sessions. Average salaries over $50,000? (Is Steve Wynn’s factored in?) $120 million per annum on goods and services? I’d take all of that with a shaker of salt, yeah. Meanwhile, no such golden opportunities are available crosstown at the Boston Globe. 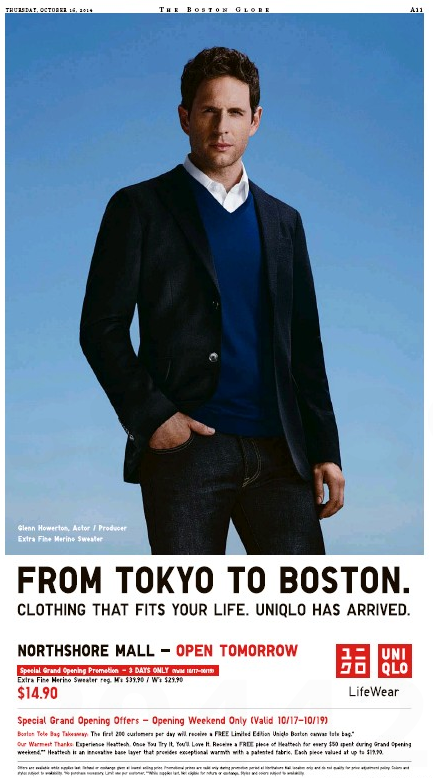 But maybe the Globe set could find gainful employment at the new UniQlo opening tomorrow at the Northshore Mall. Glenn Howerton, Actor/Producer certainly did. Hey, Globe readers: Write if you get work. This entry was posted on Thursday, October 16th, 2014 at 4:47 pm and is filed under Uncategorized. You can follow any responses to this entry through the RSS 2.0 feed. You can leave a response, or trackback from your own site.